At PlannerCon Europe a few weeks ago, I had the pleasure of meeting Sherman Crowell and his team who are the owners of Simple Stories based in Utah, USA. We had a couple of discussions over the weekend which resulted in them agreeing to sending me some samples of their planners to review. Their range is quite large covering not only ring bound planners, but also coil/spiral bound and travellers notebook styles too. 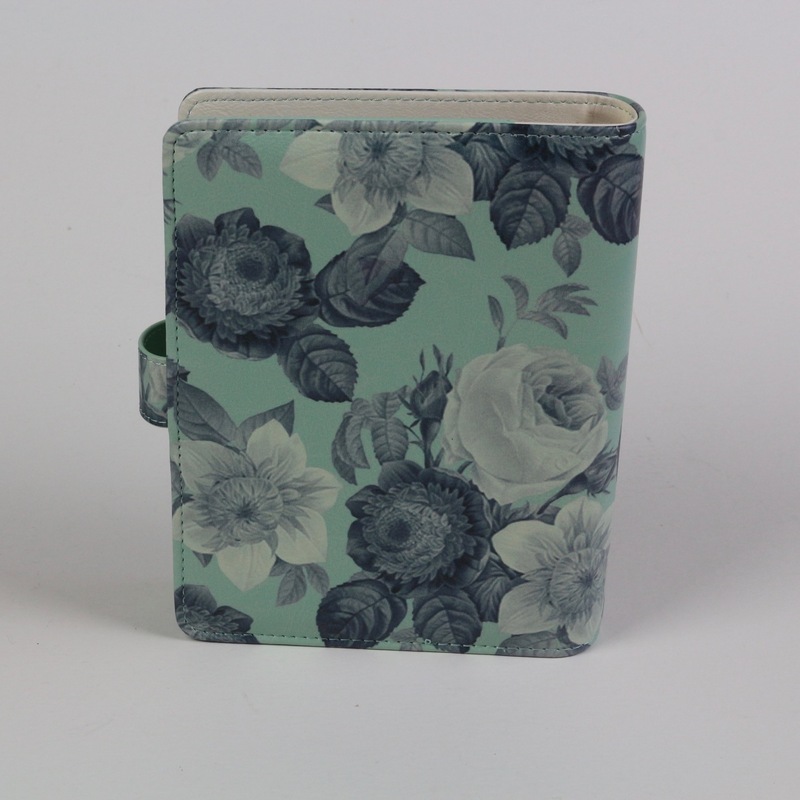 The covers come in plain colours and a variety of patterned ones too, so there is something for everyones tastes I would say. Their range includes a selection of inserts, stickers and other essential accessories, which you can purchase for your Carpe Diem planner or other brand of planner/organiser. So this is the first of two reviews that are coming up in the next week or two. We start with the Personal size organiser boxed set in Mint Vintage Floral design. 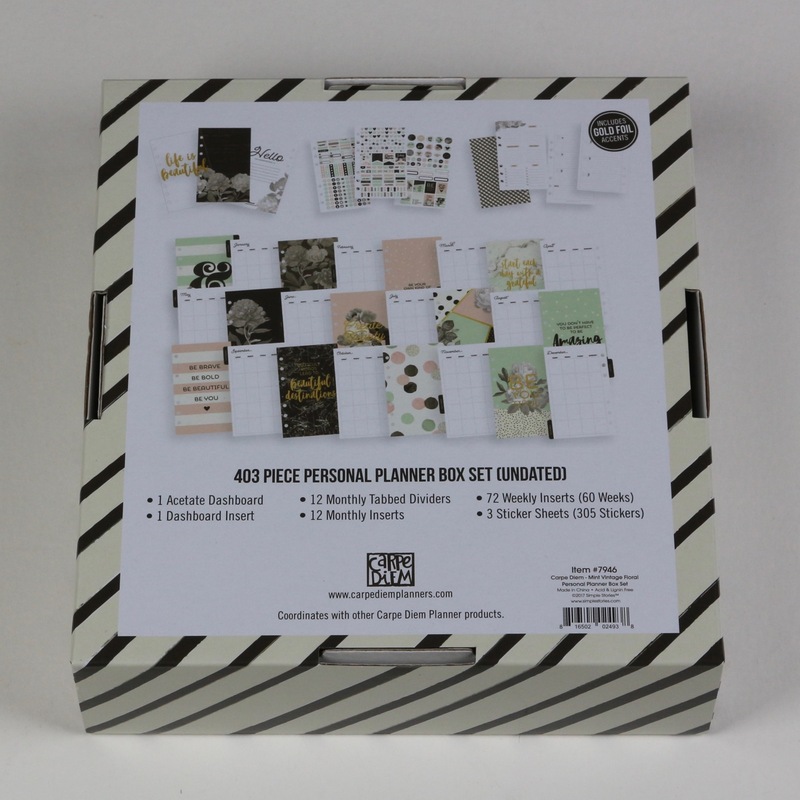 The planner comes in a presentation style box as shown here. The reverse side of the box details the full contents with illustrations as well. And then removing the card contents band to get a closer look at the design. 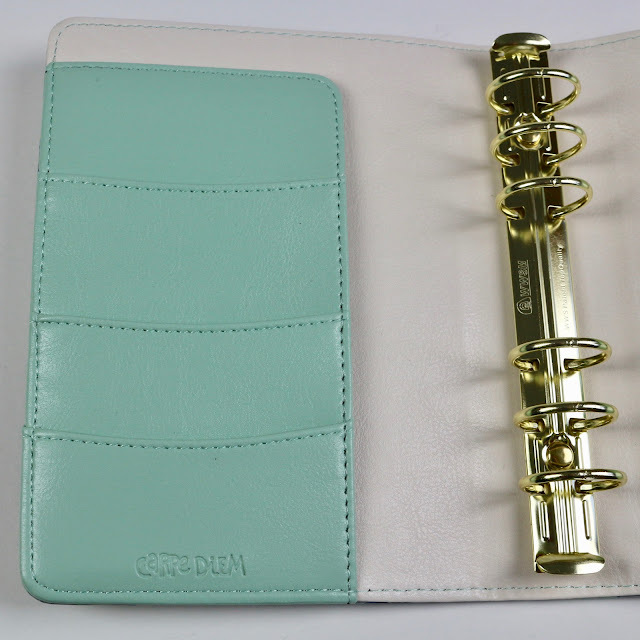 The planner is made from a simulated leather, it appears to be well made and will wipe clean should you get any spills on it or a drink leaking in your bag etc. 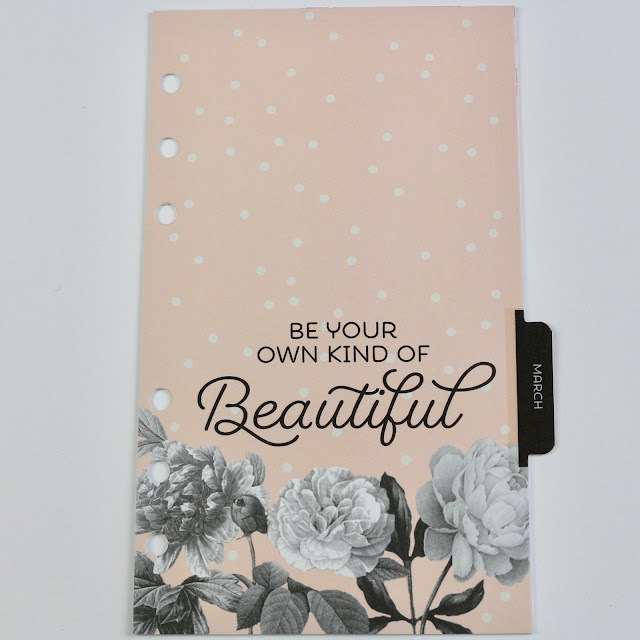 The design is continuous on to the reverse of the planner cover. The interior is finished in a complementary colour. The rings measure 26mm internal diameter (just over 1 inch in old money!) they are gold coloured finish. The ones fitted to the sample closed with a reassuring snap with no ring gaps or mis-alignment. 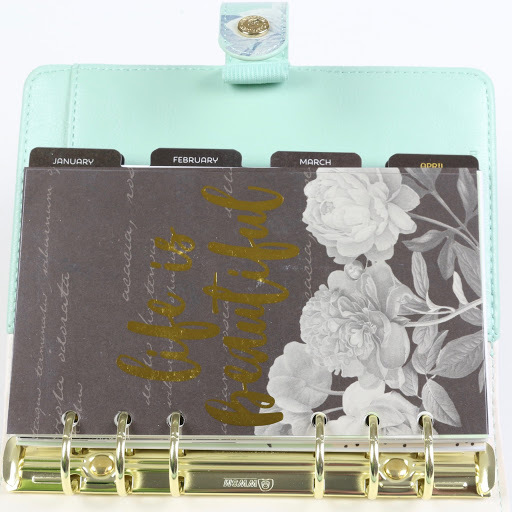 The front inside cover features a secretarial pocket along with three card pockets of different heights for business cards and other essentials you might want to carry. 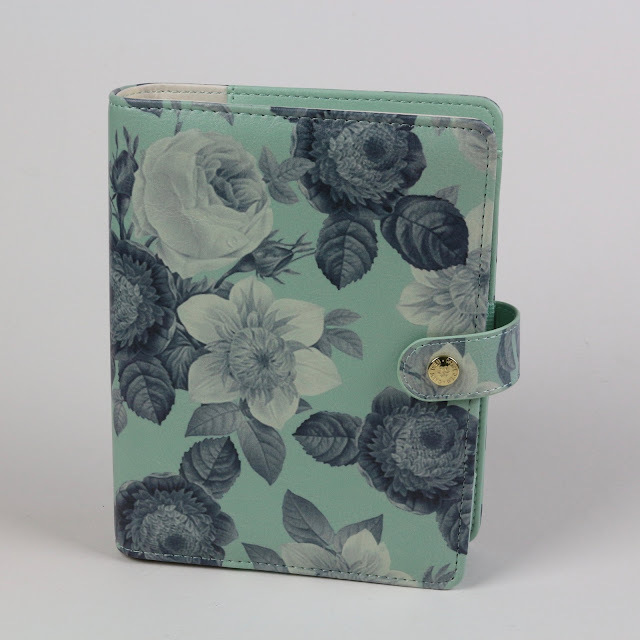 The rear inside cover has a notepad slot with a full height slip pocket behind it. 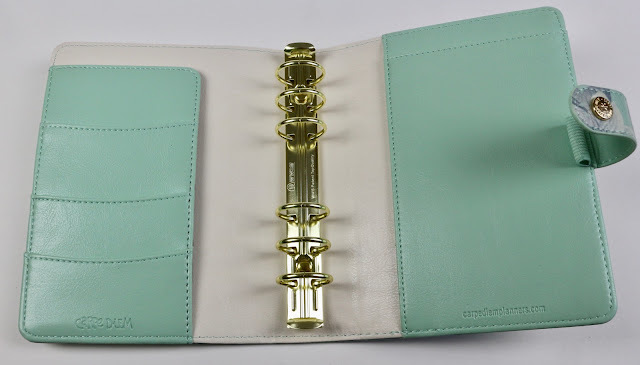 There is also a fully elasticated pen loop behind the clasp in a matching colour. The organiser comes with a full set of inserts. These are undated, they include enough weekly inserts to cover 60 weeks, as well we 12 months of month per view inserts. 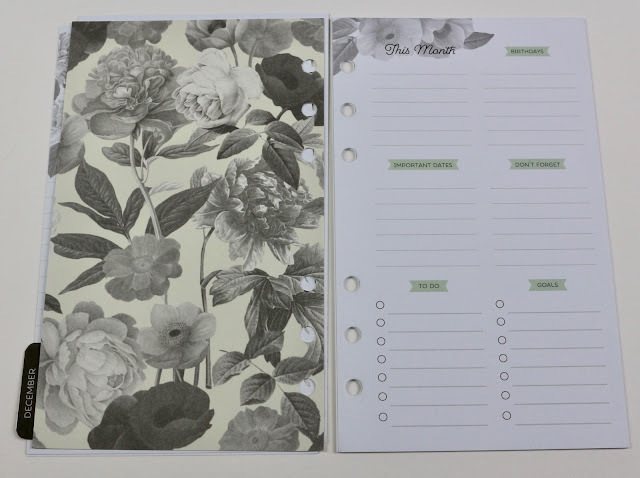 As you can see the design is simple and functional leaving you plenty of scope to decorate the pages if you wish to do so or just to use them as they are. 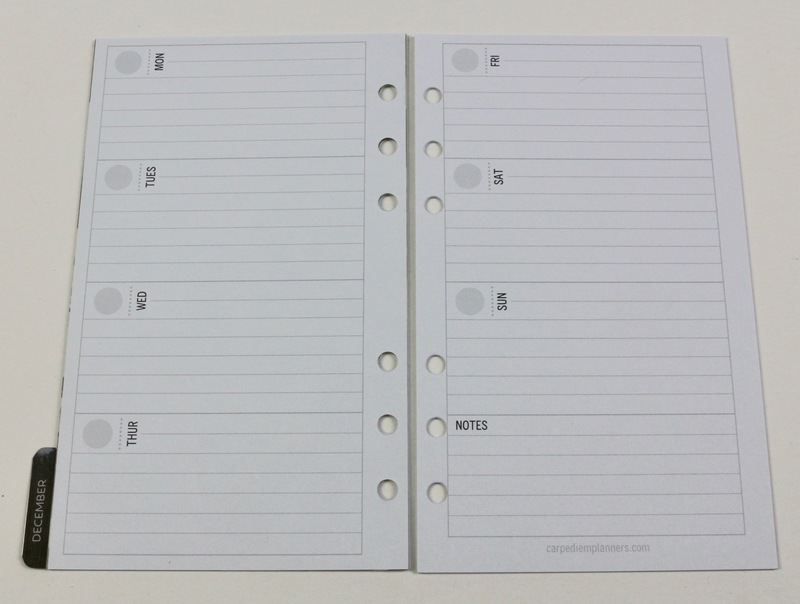 They allow equal space for each day which is always a plus point for me, with a notes section at the end of the week. It is important to note that the inserts measure 172mm high by 103mm wide, this is in common with other USA organiser page sizes. 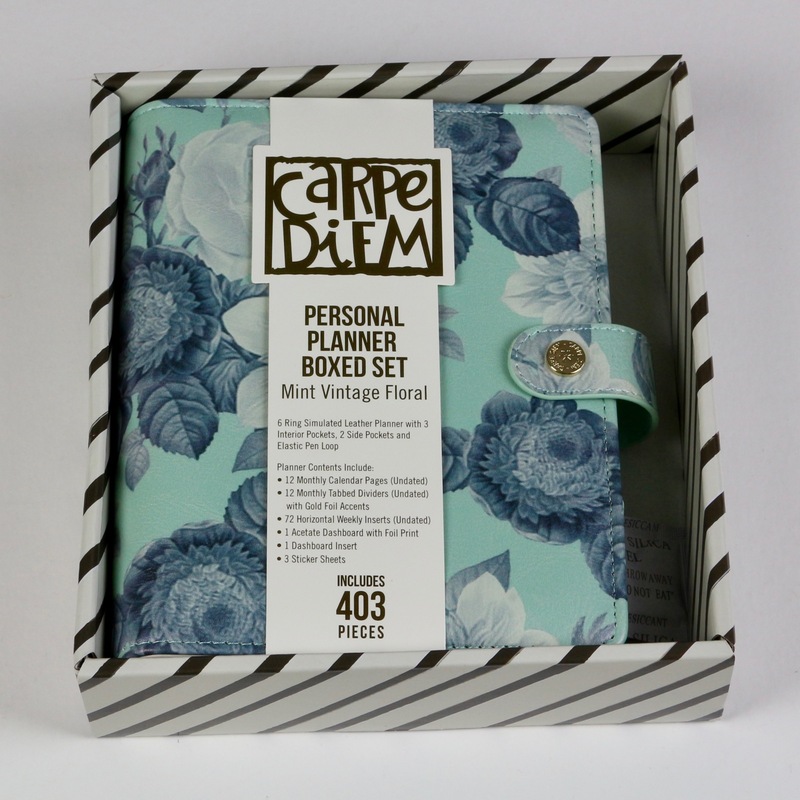 Filofax page size is 171mm by 95mm, so the Carpe-Diem organiser will take wider page sizes if you wish to use them. Whilst the weekly pages are Monday start, the monthly ones adopted a Sunday start. I know some people that prefer this combination rather than Monday or Sunday start for both. The Monthly pages do have a small amount of decoration at the top of the page. But they allow the full use of the daily boxes and there is also plenty of space in the final column for notes too. 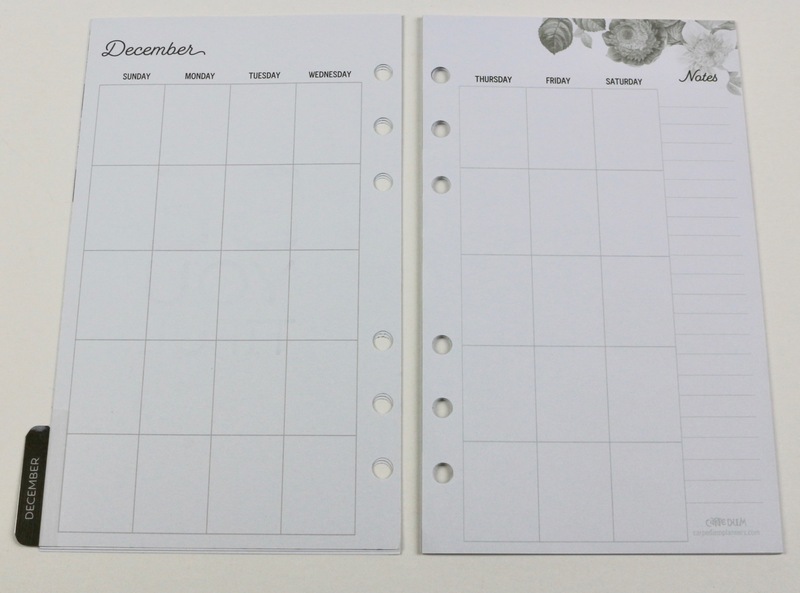 Each monthly tabbed divider has a different design on it. Also each month is preceded by a page with notes and reminders for the month, birthdays etc. The monthly tabs are a generous size which will help you finding a particular date or day to add notes and reminders quickly. 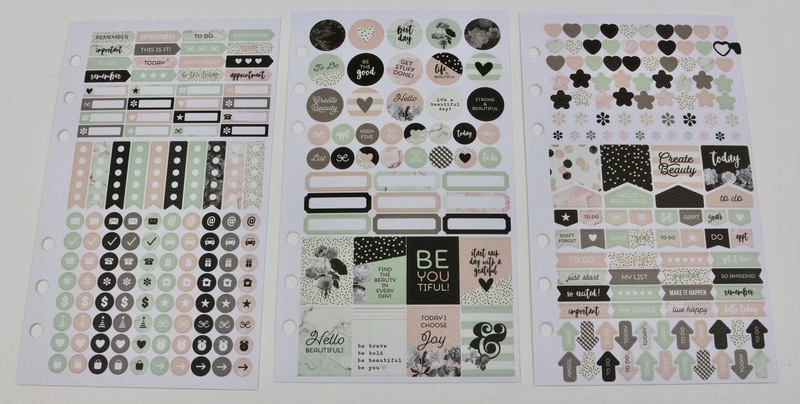 The insert set comes with three pages of stickers, quite a mixture of useful ones for highlighting events and tasks on different days. Additional sheets of these are available from the on-line store. Simple Stories products are sold world wide through a range of sellers. You can find your local one using the Store Locator on their website. Thank you to Simple Stories for supplying the sample boxed set. 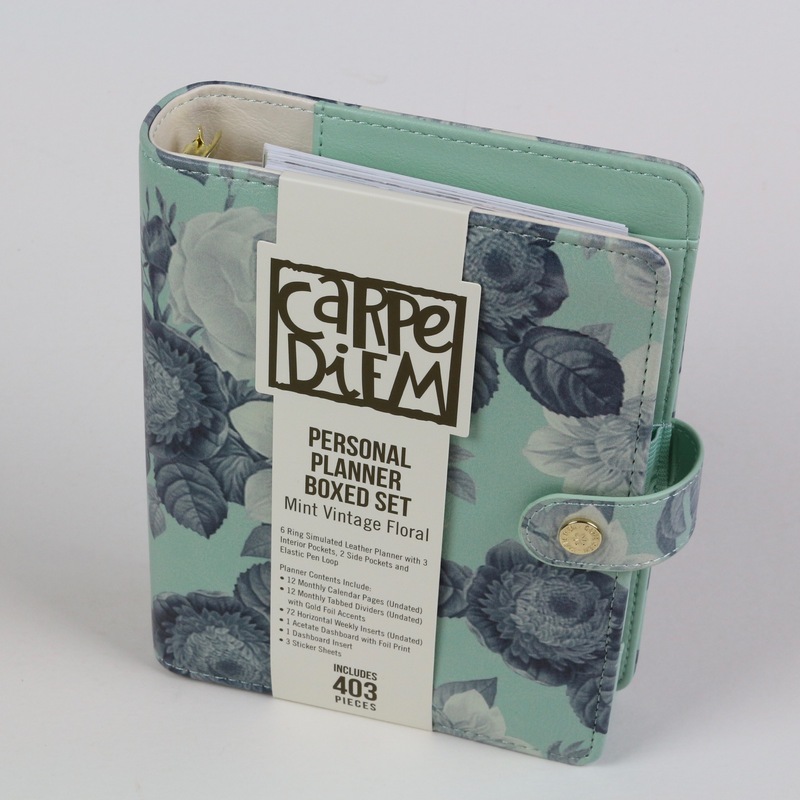 Facebook Group: Simple Stories Carpe Diem Planner Fans but there are plenty of others! 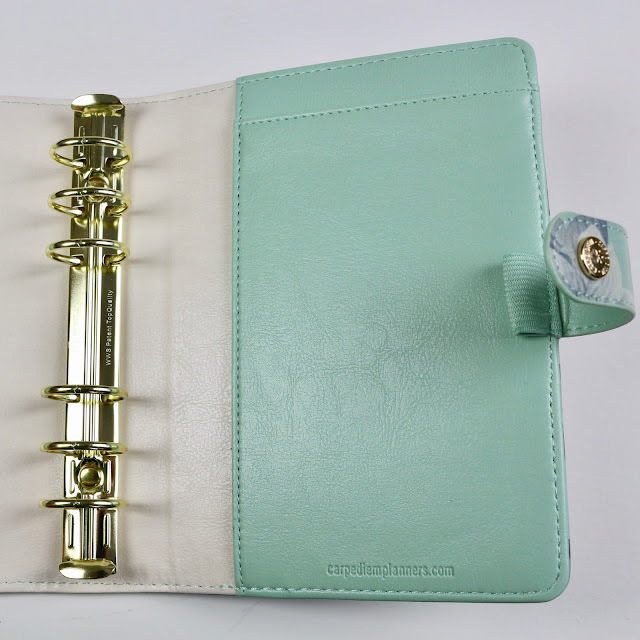 This binder is lovely! Very tempting to get me to go back to personal size.